Furthermore, Residence Trivento can help his guest to organize their routes in the Cilento National Park (by car, by boat, by horse or diving). This land is wild nature, heartbreaking coasts and blue sea. There are lots of different beaches, from sand to rocks, mysterious caves and enchanting bays. Walkers can enjoy the WWF Oasis in Morigerati, famous for the river Bussento and its falls. Lovers of culture and traditions can go to the historical centres of Pisciotta or Camerota, where craftsmanship is an art. Finally not to miss the gastronomic tradition of this land, from olive oil to the typical dishes. Residence Trivento is in Palinuro, in the Cilento National Park, not far from the Arco Naturale, an enchanting sandy beach. It is situated on a hillside and surrounded by olive trees and typical Mediterranean vegetation. It is approximately 3.5km from Palinuro town centre. It consists of two different groups of apartments connected by a small street and a sport-and-leisure centre. Its quiet position makes it ideal for families who are looking for a place to relax and enjoy nature. The sport-and-leisure centre, 1.200m from the beach, is the heart of the whole structure and includes: a reception office, two separate swimming-pools, one for adults (m.12.5x25) and a shallow one for children (m.6x11.5) with deck-chairs and sun umbrellas open from 31.05.19 to 05.10.19, snack bar, tennis- and football/ volleyball courts, bowls, table-tennis, archery and video games, mini and junior club, organized entertainment from 15.06.19 to 07.09.19 internet point wi-fi, laundry service, safe, telephone in the apartments, possibility of boat trips, excursions and guided tours, special terms with the local diving centre. The first group of apartments is situated m.250 from the sport-and-leisure centre and m.1.500 from the beach. The second group is further up the hill about m.850 from the sport-and-leisure centre and m.2.100 from the beach. consists of 10 small villas, each of them divided into 2 or 3 self contained apartments with roof terraces complete with table, chairs and deck-chairs. The villas are situated on the hill and are surrounded by rich Mediterranean vegetation. 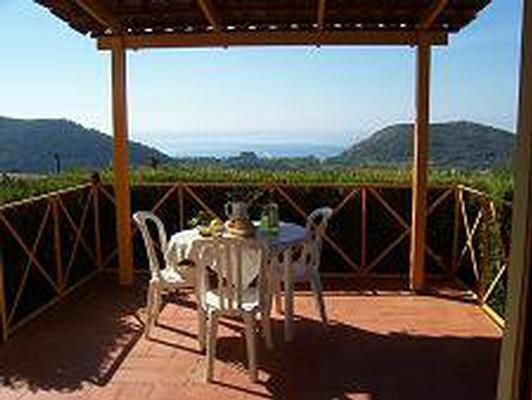 They have a wonderful panoramic view of Cape Palinuro and the Mingardo beach. All the apartments have a modern furniture with telephone in each apartment and parking space. Facilities in the neighbourhood the sport-and-leisure centre: Restaurant m.200, pizzeria m.500, supermarket m.700, pharmacy m.900, medical service m.700, bus stop m.700, horseback riding m.850, boats for hire m.1.200, centre of Palinuro km.3.5, train station km.7, diving school km.5.5, cars and mopeds hire km. 3.5, disco km.2.5 , beach convention km. 3. The following apartment is in the second group. - 1 Bedroom apt. 2/3 people, ground floor (27 sq.m. ), furnished patio/terrace 15 sq.m. Bedroom with double bed and single sofa bed, living room with kitchenette, bathroom with shower. Laundry Service: per object and day according to consumption (Mandatory). Beach service with 1 umbrella and 2 deckchairs with shuttle service from 03.08.19 to 24.08.19: per object and day Costs amounting to 95 EUR (optional). Beach service with 1 umbrella and 2 deckchairs with shuttle service from 06.07.19 to 03.08.19 and from 24.08.19 31.08.19: per object and week Costs amounting to 75 EUR (optional). Beach service with 1 umbrella and 2 deckchairs with shuttle service from 15.06.19 to 06.07.19 and from 31.08.19 to 14.09.19: per object and week Costs amounting to 60 EUR (optional). Beach service with 1 umbrella and 2 deckchairs without shuttle service from 03.08.19 to 24.08.19: per object and week Costs amounting to 70 EUR (optional). Beach service with 1 umbrella and 2 deckchairs without shuttle service from 06.07.19 to 03.08.19 and from 24.08.19 to 31.08.19: per object and week Costs amounting to 55 EUR (optional). Beach service with 1 umbrella and 2 deckchairs without shuttle service from 15.06.19 to 06.07.19 and from 31.08.19 to 14.09.19: per object and week Costs amounting to 40 EUR (optional). Swimming towels: per person and week Costs amounting to 2 EUR (optional). Towels: per person and week for rent at a price of 3 EUR (optional). Palinuro and its surroundings offer the perfect route for those who want to discover day by day a new aspect of its life. Far from mass tourism, this place is the right combination of naturalistic wonders and cultural traditions. Light blue sea is mixed with folklore, for a holiday full of emotions. Beach service with 1 umbrella and 2 deckchairs with shuttle service from 05.08-26.08.16 (per property and day, included in price 85 EUR). Beach service with 1 umbrella and 2 deckchairs with shuttle service from 08.07 - 05.08.17 and from 26.08-02.09.17 (Per property and week, to be brought by the traveller 65 EUR). Beach service with 1 umbrella and 2 deckchairs with shuttle service from 17.06 to 08.07 and from 02.09 to 16.09.17 (Per property and week, to be brought by the traveller 50 EUR). Beach service with 1 umbrella and 2 deckchairs without shuttle service from 05.08-26.08.17 (Per property and week, to be brought by the traveller 60 EUR). Beach service with 1 umbrella and 2 deckchairs without shuttle service from 08.07 - 05.08.17 and from 26.08-02.09.17 (Per property and week, to be brought by the traveller 50 EUR). Beach service with 1 umbrella and 2 deckchairs without shuttle service from 17.06 to 08.07 and from 02.09 to 16.09.17 (Per property and week, to be brought by the traveller 35 EUR). Cot (per property and day, included in price 3 EUR). Swimming towels (per person and week, according to consumption 2 EUR). Towels (per person and week, according to consumption 3 EUR).